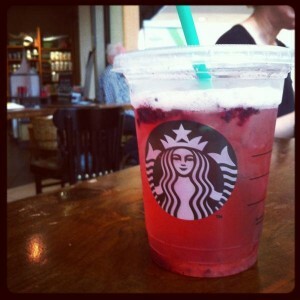 Today Starbucks had “Free Friday Refreshers.” From noon to three the Starbucks company gave away tall Cool Lime and Very Berry Hibiscus Refreshers. 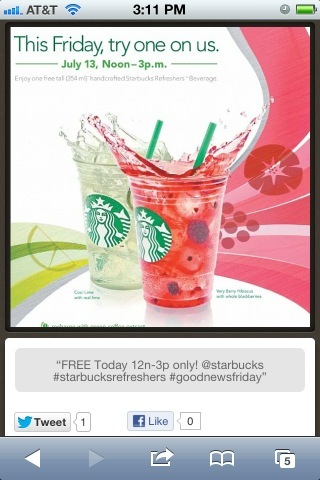 To me, free drinks sounds like a good day, especially for a college student without a job. At fifteen minutes to twelve, Josiah and I hopped in the car and started our day at the Starbucks on Sunshine. Then we made our way downtown, I dropped off an application, and then we hit the Starbucks on Glenstone before stopping at Thai Express for some lunch. I tried Pumpkin Chicken Curry which was fantastic! Then I dropped off another application, and we headed to the Starbucks in Battlefield Mall. Next, we went to the Starbucks on Campbell and hit up the Republic Price Cutter Starbucks on the way home. Five Starbucks total. After trying both the Very Berry Hibiscus and the Cool Lime Refresher, I’ve decided the Cool Lime is the better of the two. The Very Berry tastes like a weak version of watered down blackberry syrup. The lime one tastes fresher. While the Refreshers were alright in taste, Idefinitely wouldn’t pay money for them. If you’re looking for a refreshingly cool summer drink, I would suggest grabbing a Sobe Coconut Lifewater. Each drink has a mix of coconut and other fruit. One Lifewater has only the flavor of coconut. 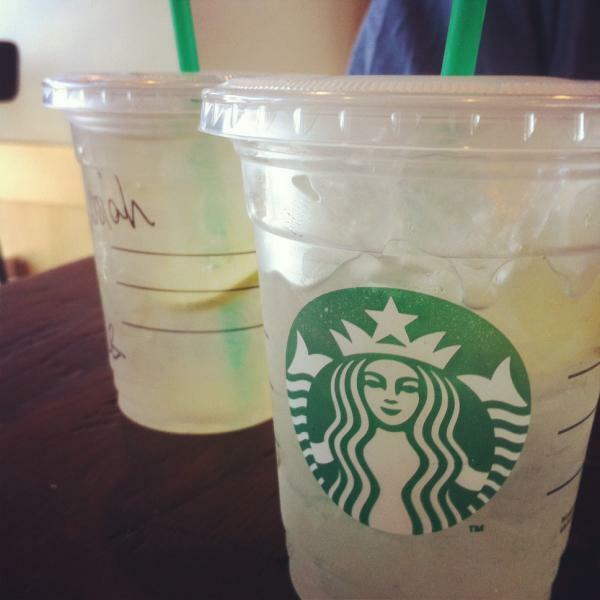 The drinks are much cheaper and taste better than the Starbucks beverages. Many local coffee shops carry Italian ice beverages which pack a better taste than the Starbucks Refreshers at a much cheaper cost. You could also stop by one of them instead! Overall, it was a great day. I enjoyed Starbucks hopping for free drinks. The drinks were pretty good, but not a personal favorite. Coffee is more my cup of tea!